The Pixometer app offers a simple way to track consumption of water, electricity or gas, even if you only have a dumb meter. For utilities, it could be a new channel for reaching custoemrs, or a way to enhance existing customer service apps. Just tell the Pixometer app which meter you're going to read, point the phone's camera at it, and let the optical character recognition software do the work. Once the app gets a lock on the numbers, it speaks the reading out loud and stores it, and the date, in that meter's file. You can even enter the price per kilowatt-hour, for electricity, or per cubic meter, for water, and the app will show you the expenditure since the last meter reading, and what that works out to per month. For gas, things are a little more complicated as the meter typically records consumption in cubic meters, but the utility charges per kilowatt-hour: To estimate your costs, you'll need to tell Pixometer the price per kilowatt-hour and the calorific value (in kWh/m3) from your last gas bill, and let your phone work it out. Of course, the app won't save you money by itself, but becoming aware of your consumption is the first step to managing it. If you need help budgeting, or can never find pen, paper and pocket torch when it's time to read the meter, then Pixometer could help. It can read meters with LCD displays, or those with mechanical roller counters. It uses video rather than still images to obtain an accurate reading, as this makes it easier to adjust for low lighting and to see past reflections on the meter glass as the camera moves around, said Pixolus CEO Mark Asbach. There's also a sanity check: Is the current meter reading higher than the previous one? Pixometer is free for personal use. 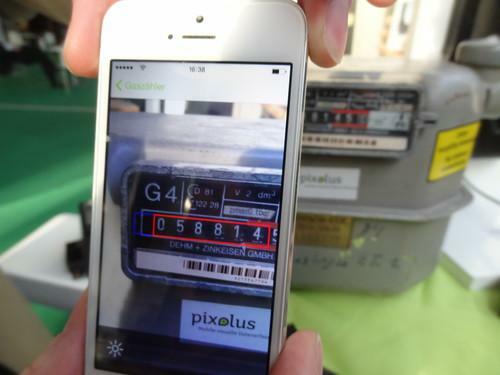 Pixolus hopes to make its money by selling branded versions of the app to utilities, or licensing the meter-reading core for use in their existing customer service apps. For utilities, the app can record the image on which the meter reading is based should disputes arise or errors occur. It also provides a channel through which to push messages to customers -- perhaps offering them discounts if they submit meter readings on time, or encouraging them to switch tariffs. The company has already landed its first utility client in Germany, and is seeing some interest from other countries, Asbach said. One thing that may limit the app's appeal in the U.S. and U.K. is that it can't read the older dial-type meters that are common there. That's not because the image recognition problem is insurmountable, Asbach said: Rather, since such meters are not found in Germany, the team has had no reason to develop the capability. If there's interest from markets using dial-type meters, though, it could soon be added, he said. Pixometer is available now for iOS 7 or higher, and an Android version will be in the Google Play store shortly, Asbach said.